Every child will definitely fall in love with this amazing toy! The music xylophone with mallet will give plenty of joy for girls and boys. The colourful glockenspiel for children is a perfect idea for a gift which teaches and entertains. It is made from lightweight and safe for children materials. The keyboard for children with balls dont have any dangerous elements, so the toy can be used already by children who are just one year old. This toy with its vivid colours stimulates hearing ability and sight.Set includes three small, colourful balls and lightweight colourful mallet. Every ball has a different colour - it needs to place on colourful hoops. (e.g you can play with your child to place a ball on a hoop of the same colour) and after it is done, you need to tap delicately with a mallet. The ball which falls into a container in the keyboard will hit the key which will produce a sound. 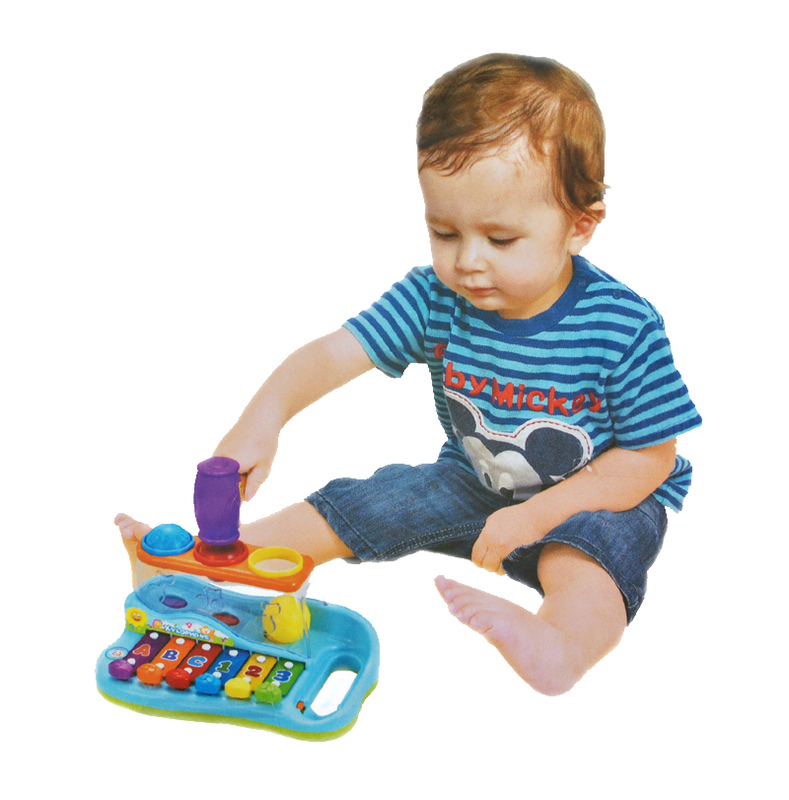 The toy has also a little spout where the balls fall out to get ready for another round.Beautiful, colourful xylophone for children with balls and mallet have 6 multi-coloured "keys" - you just need to hit it delicately with the mallet and it will produce a sound. The colorful glockenspiel for kids will perfectly stimulate tactile senses - all the elements are made from different textures, it has convex symbols (notes), which awaken touch receptors in tiny fingers. The music glockenspiel for the younger children will teach them to recognize and name colours, first letters and numbers. The toy will also train hand-eye coordination, which will pay off in the future.